This week looks like a promising week for grilling, so I am building the menu around the grill. MONDAY: Turkey burgers with pasta salad and tomato & avocado salad. THURSDAY: Marinated, grilled chicken breasts with grilled zucchini and roasted potatoes. FRIDAY: The Hubs is meeting a friend for dinner, so the girls and I will go out. SATURDAY: Hubs is in charge...something on the grill. What's on your plate this week? 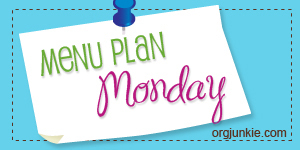 For more meal-time inspiration, see my meal planning posts, and stop by Organizing Junkie's Meal Plan Monday to see what others are munching on.